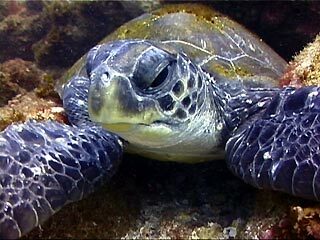 Sea turtles are reptiles whose ancestors evolved on land and returned to the sea to live about 150 million years ago. 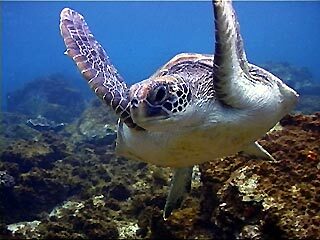 Green turtles have an oval or heartshaped carapace, which is part of their skeleton. They are not able to retract back into their shell like some of their terrestrial cousins can. The green turtle can grow up to 1 meter in length and weigh 150 kilograms. The green turtle is considered endangered. 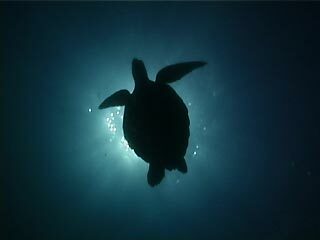 Because of their special blood chemistry, green turtles are able to store oxygen in their blood. This enables them to stay underwater for up to two hours when sleeping. However, when they are eating they will surface every ten to fifteen minutes. Juvenile green turtles do not develop this ability and have to sleep floating at the water’s surface. 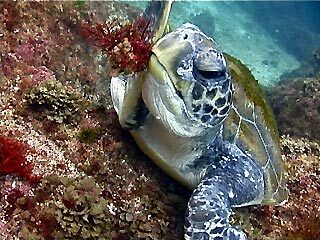 Unlike the other sea turtles adult green turtles are believed to have a completely vegetarian diet consisting of different kind of algae and seagrasses. Turtles sometimes travel up to 3000 km to reach their breeding site. Males and female turtles aggregate in the shallow waters surrounding the nesting beaches to mate. During the breeding season only the females will come ashore. On five or six different occasions approximately 100 round smallish eggs with a parchment like shell are deposited in the sand. Female turtles do not lay eggs every year, but only every three to five years. Nests are raided by natural predators such as goannas or by introduced species like foxes, feral pigs and dogs. In some locations people will take turtle eggs for consumption, when over-harvesting takes place this also can be a threat to the survival of the turtle species. In some locations where the green turtle was once abundant, they are now extinct. Green turtles seem to have a high affinity for particular nesting beaches and not just any beach will do. The beaches have to be high enough and the sand cannot be too compact. Once a female is disturbed while laying eggs, she might never return. Loud noises and bright lights can deter the females. Beach compacting by heavy trucks, 4WD driving, an increased number of people using the beach and attempts to stop erosion of beaches by beach armouring makes it difficult for the females to create a nesting site. After 8 – 12 weeks at night the hatchlings appear from the nest and will try to get into the water before the heat of the sun will kill them. Many will not survive as predators, such as sea gulls and crabs are plenty. Bright lights around the nesting beaches not only can confuse the female laying eggs, it also threatens the hatchlings which will take the street lights as their guide to find the ocean. The hatchlings drift for an undetermined period of time in the open ocean finding shelter in weed lines until their carapace reaches 20 – 25 cm. They then settle in more coastal waters where they live of the reefs until after many years they reach sexual maturity. It is thought that green turtles return to the beach where they hatched themselves to mate, presumably using the earth’s magnetic field as a navigation tool. 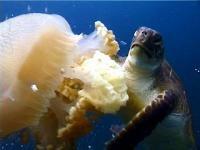 Commercial fishing nets are a huge threat to the green turtle and other marine turtle species. They get trapped and drown before help arrives. In the USA it is compulsory to use turtle excluding devices (TED). Studies have shown an enormous decline of turtle and other marine mammals being trapped in the nets that use TEDs and only a minimal loss of catch for the fishermen. A problem thought specific for green turtles is the fibropapilloma tumour. It is a form of cancer that grows on all soft tissues in between scales and scutes, in the mouth and around the eyes. The cancers can also spread to internal organs. The tumours often increase in size and number until the turtle is seriously debilitated and death is a common outcome. A new, alarming development is that fibropapilloma tumours are now also observed on different species of sea turtles. Because sea turtles have to come to the surface to breath another threat they face is the propellers of motorboats. The propellers can do enormous damage to the carapace and, even more seriously, the head of the turtle. When turtle watching, listen carefully to the instructions of your guide. Don’t pollute our waters or beaches. When boating in an area where turtles are common, slow down to prevent deadly collisions. Let your local government know they should remove shark nets from the beach as this does more harm than good, not only for sea turtles. It is also very important that Turtle Excluding Devices become compulsory for the trawling industry in entire Australia as it can save many lives. Participate in local community groups active in turtle conservation to see how you can help too. http://www.environment.gov.au, Home Page of Environment Australia. Symposium. http://www.turtles.org/overview.htm, Turtle Trax is dedicated to the wonder and beauty of sea turtles. “Reptiles and Amphibians of Australia” Harold G. Cogger. Sixth Edition. Edited by Peter Hutton. This entry was posted on Saturday, December 11th, 2004 at 4:10 pm	and is filed under Marine Life Articles. You can follow any responses to this entry through the RSS 2.0 feed. Both comments and pings are currently closed.